One of the reasons I started this blog was to stretch myself in my cooking abilities, trying new recipes or foods, or just trying to add variety to our diets. Tacos are one of those things I just didn’t make, mostly because I used to associate taco meat with the “meat paste” they use as some fast food restaurants. Then I remembered this recipe that I got years ago when I took Foods class in high school. This is a yummy recipe for taco meat that is just as easy as dumping a packet of seasoning onto the browning meat, but without the saltiness that comes from those packets. It is done quickly and is a great meal for a weekday night or when you are on the go! 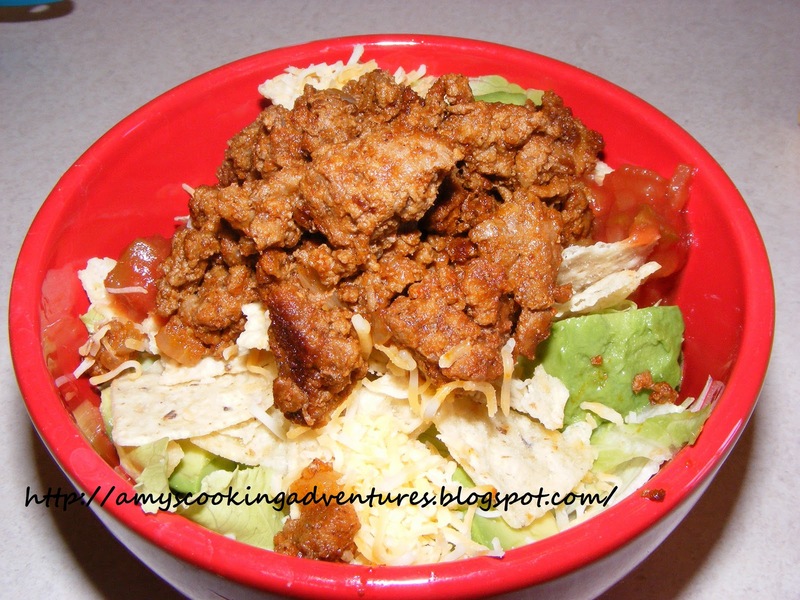 Again, this is a very versatile recipe that can be used as tacos, taco salad, burritos, or super nachos with your favorite toppings. As you can see from the photo, I made mine into a taco salad with lettuce, cheese, avocado, salsa, crushed tortilla chips, and the taco meat. Delicious! Brown meat with onion and garlic. Cook until meat is browned and onion is tender. Add tomato sauce and spices. Simmer approximately 15 minutes. Keep hot until ready to serve. Serve with your favorite toppings as tacos, super nachos, or taco salad. Amy, This recipe is perfect! The only thing I did different is I used just a little bit more tomato sauce than the 1/2 cup the recipe called for because it wasn't quiet enough for my preference. I really liked it being less salty. Especially when making nachos because there is so much salt on the chips already. PS--there is a brand of chips I found with only 35 or so mg of sodium per serving...I can't remember the variety right now, but I will try to remember to check it out and let you know.